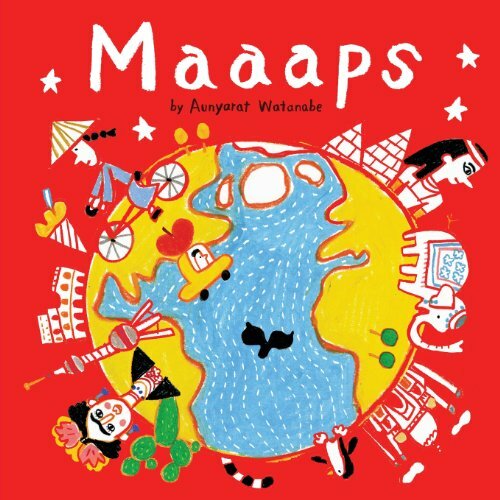 Here's a fun book of wonderful map drawings by Japanese illustrator Aunyarat Watanabe. The book's published by They Draw and Travel, a website of illustrated maps contributed by artists from around the world. But for this artbook, it's just Aunyarat Watanabe with her beautiful colourful map drawings. I'm not sure what art materials she uses but it looks like colour pencils or crayons. The vibrant colours just pop out. The illustrations are cute and whimsical, with icons from the different places and a collage of interesting interpretation of tourists attractions. The art is great. The book is really brief though at 44 pages. 19 maps plus one last map is empty for you to draw on. The text describing each place is also incredibly brief. Overall, it's a delightful artbook. The website They Draw and Travel is actually run by Studio SSS, the same team that brought you They Draw and Cook. Hopefully, there will be another thicker book of maps from the artists featured from the website. If you like more map art, check out A Map of the World: The World According to Illustrators and Storytellers.